Well, they finally paid up after the Texas Rangers lost the World Series in five games to the San Francisco Giants. On Friday's CBS11 early morning newscast, anchors Scott Sams and Lisa Pineiro and traffic reporter Teresa Frosini donned stick-on beards and tried to sing their way through "I Left My Heart in San Francisco." It was the end result of a wager made with a San Francisco TV station, whose dawning-of-a-new-day anchors would have been required to sing "Deep in the Heart of Texas" while wearing cowboy hats had the Rangers won. Pineiro, completing her first full week on the job after her Thursday, Oct. 28th debut, seems to be settling in pretty seamlessly at CBS11. Long No. 4 in the early mornings, the station actually rose to the top of Wednesday's 6 a.m. ratings among advertiser-favored 25-to-54-year-olds. But Thursday's Nielsens knocked CBS11 back down to fourth place. And a distant fourth at that. Here's video of the worst rendition of "Left My Heart" in recorded history. Sorry it's so small, but you can blow it up by clicking the symbol in the lower right hand corner. 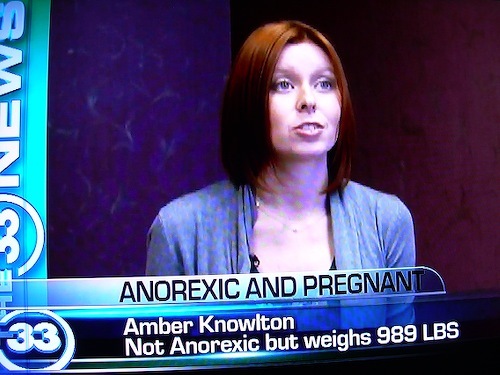 Thursday's 9 p.m. newscast on CW33 included a classic graphics gaffe tied to reporter Barry Carpenter's story on how anorexic women are more likely to have unplanned pregnancies because they often don't have regular menstrual cycles. Carpenter interviewed a pregnant 98-pound woman who is not anorexic, he told viewers. Given that information, check out the caption that accompanied the story's video of Amber Knowlton.